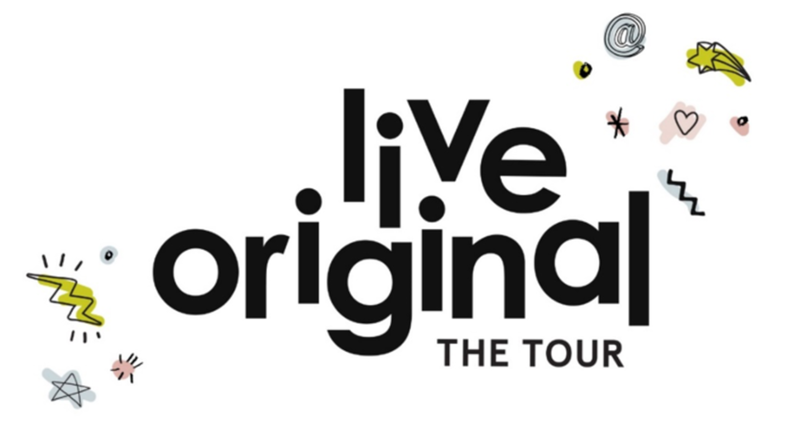 LIVE ORIGINAL TOUR Also Features John Luke Robertson, Anthem Lights, Chris McClarney of Jesus Culture, Steven Malcolm and Hollyn! Nashville, Tenn. (Oct. 11, 2017) — On your mark; Get set; Go! On October 19th, The LIVE ORIGINAL TOUR brought to you by Help One Now is poised to begin a 16-city sprint across the nation. Best-selling author, speaker, and role model Sadie Robertson is anticipating all that God will do while she and her friends are encouraging thousands of young adults “to live uniquely and be the person God made [you] to be,” she said. Kicking off at Whitesburg Baptist Church in Huntsville, AL, the tour features Sadie’s older brother, author and speaker, John Luke Robertson; the innovative, high-energy harmony of Anthem Lights; worship sound of Jesus Culture’s Chris McClarney, Christian rapper and hard-hitting hip/hop artist Steven Malcolm; and the unstoppable American Idol alum artist Hollyn. With tickets selling at a brisk pace and several venues selling out weeks in advance, now is the time to save your spot. With all the music and ministry planned for each evening, these events are destined to serve as milestone markers in the lives of thousands of young adults, teens and their unchurched friends. Sadie commented, "I could not be more excited for this LIVE ORIGINAL TOUR. I am really digging deeper to make a heart connection between myself and the fans that come to the show. The whole team is praying, dreaming, and creating together about what the night will look like. With that being said, it is going to be a very intentional show that I don't think people are going to want to miss. It is going to be a life-changer. So, everyone come out and enjoy this experience with us!" The tour is brought to you by Help One Now, a not-for-profit organization committed to empowering and equipping local leaders in multiple countries to care for orphans and vulnerable children in order to transform communities and break the cycle of extreme poverty. At each stop on the LIVE ORIGINAL TOUR, attendees will have the opportunity to partner with Sadie and join One Squad to help change the world at home and abroad. “We are thrilled to once again partner with Sadie for the 2017 LIVE ORIGINAL TOUR. Over the past year, hundreds have joined the One Squad community and Help One Now to create a movement of life-changing impact in seven countries around the world. We believe in the power of One, and that TOGETHER, our collective efforts will continue to empower the world’s most vulnerable!” stated Chris Marlow, CEO of Help One Now. Also joining the tour as featured sponsors are Trevecca Nazarene University, Samaritan’s Purse, Roma Boots and Thomas Nelson. In anticipation of the excitement surrounding this tour, Sadie Robertson and her team will be launching the LIVE ORIGINAL online store in mid-October, with fun merchandise and resources to show the world that you are living life uniquely, creatively and just the way you were meant to be! The store will be live at www.liveoriginal.com. Additionally, Sadie has recorded a song with Anthem Lights titled “Just Be You” as a theme song for the tour. You can purchase that now at all digital outlets. Tickets start at $18* each for groups of 10 or more. General admission tickets are $25 each and there will also be Ultimate Fan Experiences and Pizza Party Tickets with special perks. For all the ticketing details and more info. check out LiveOriginal.com or PremierProductions.com. Get your tickets now before they sell out! Promoted and produced by Premier Productions. *Additional fees will apply to all ticket prices. Sadie Robertson catapulted into stardom as a young teenager, starring in the hit reality series A&E’s Duck Dynasty as well as at just 17 years of age landing first runner up on ABC’s Dancing With The Stars Season 19. The now 20-year-old has expanded her platform as a motivational speaker and advocate for her generation. On a mission to empower her peers in the name of positivity, self-confidence, and a call to “live original,” Sadie designed and launched a 16-city motivational tour called the Live Original Tour in 2016 and recently announced her plans for Live Original Tour 2017 set for this fall. Sadie has also ventured into acting, appearing in “God’s Not Dead 2,” the 2016 film about Columbine shooting victim Rachel Joy Scott “I’m Not Ashamed,” as well as taking on a starring role in new Hallmark movie, “Sun, Sand, & Romance” released in August. Sadie embodies the creative and entrepreneurial spirit of the Robertson family and has carried her philosophy into multiple business ventures including her own phone app, SADIE, a prom dress line with Sherri Hill, school supplies for DaySpring, jewelry and home goods with Glory Haus, and a fashion line with Wild Blue Denim. She has also partnered with Roma Boots and worked alongside them in their mission to “give poverty the boot” and spends time every year traveling the world serving those in need with One Squad, a group of young people that Sadie created with Help One Now, that seeks to engage her generation in social justice by caring for children and orphans around the world. Also a best-selling author, Sadie is currently working on the follow up to her New York Times best-selling 2014 book, Live Original: How the Duck Commander Teen Keeps It Real and Stays True to Her Values which along with her newest books, Life Just Got Real and Live Original Devotional are available at retailers nationwide. For more information, please visit www.liveoriginal.com.